Ian’s thesis was an investigation into rail squats with the primary objective of reviewing the current minimum action standards for the repair or replacement of rail with a squat defect present. Ian utilised the ANSYS finite element package to explore two methods of examining the nature of squat defects in rails. The first method used a semi-elliptical model with direct loading to a contact patch. The second model involved the creation of a complex squat-like shape, similar to a saddle shape, which was a shape repeatedly encountered in the literature review. The testing & data analysis found that the standards published by Deutsche Bahn were found to be the most accurate. Ian Mackay receiving the 2015 Railway Engineering Student Thesis Award from Megan Wood, RTSA Queensland Chapter Chair in Brisbane, 2015. David’s thesis investigated methods for improving detection of faults in traction substation equipment on the New South Wales electrified rail network. Within the substation equipment there exists a zone which has only limited protection systems and which relies on upstream protection systems to detect faults. His thesis involved using MATLAB’s Simulink software to model the existing traction substation system during normal operation. The simulation was also utilised to observe the effects of faults on the system, applied in different locations and for different fault types. The simulation enabled measurement of the voltage and current waveforms in several locations in order to develop a method of predicting faults. Several detection methods were developed in the thesis which compares the rate of change current, power differential and Fourier analysis of the direct current output. These methods were implemented into the simulation and were able to differentiate a fault to normal operation. These proposed protection systems have significant implications for improved reliability of rail traction supply and for further implementation with high voltage rectifiers. 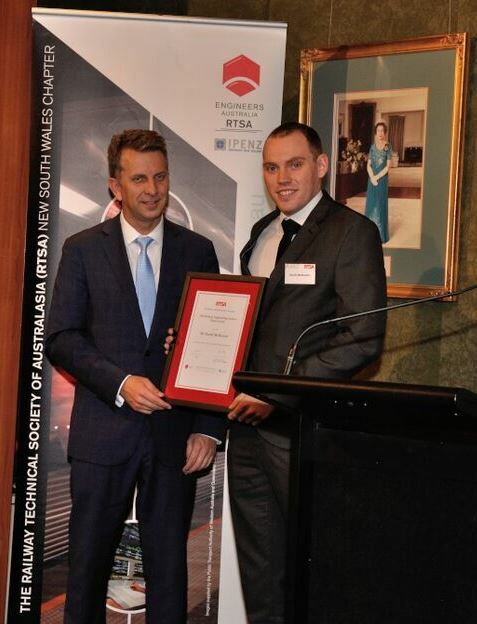 David McKenzie receiving the 2015 Railway Engineering Student Thesis Award in Sydney, 2015.